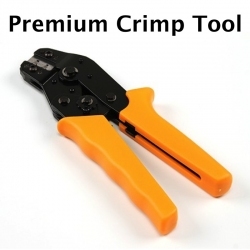 High quality and easy to use crimper tool to crimp male and female pins onto wire. Ratcheting mechanism allows for easy use with less force, and once the connector is crimped the correct distance it is automatically released. If you're fixing many wires, motors, or sensors and crimping multiple connectors, this tool is a must! Wires, housings, crimp pins, and kits to repair connectors also available. Please note: Appearance such as color of the tool may vary from image.